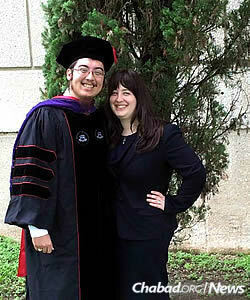 Ari “Brian” Hutchinson had a separate graduation that took place the day before Shabbat. Here he is with, from left, Benjamin Cohen-Kurzrock, Chuck Hooten, LaDelle Davenport, University of Houston Law Center dean Leonard M. Baynes, Hutchinson, Michael Ryan and associate dean of student affairs Sondra Tennessee. 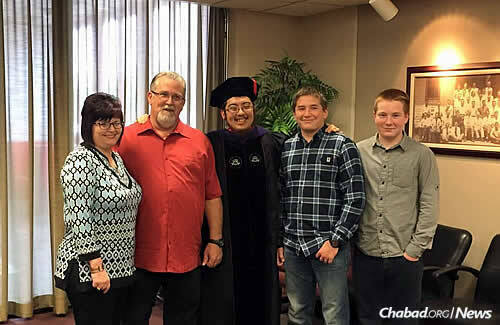 When Ari Hutchison learned that his graduation from the University of Houston Law Center would be on a Saturday, the Jewish Sabbath, the Torah-observant student wondered how he would tell his father. His dad, Daniel Hutchison, is extremely proud of his son’s achievements and wanted to celebrate in the usual way—by attending the graduation ceremony. So when his father asked him to “please just find a way to go,” the 24-year-old discussed the situation with Rabbi Chaim Lazaroff, co-director of Chabad of Uptown in Houston with his wife, Chanie. The rabbi described the challenges of attending the public ceremony on Shabbat, which in this case presented hurdles that could not be crossed, and Hutchison decided he wouldn’t be going. Instead, Hutchison did the only other thing he could think of—and asked the school for an alternative. He was blown away by the response: They would host a private gathering just for him, complete with a processional, speeches, photos and the traditional adorning of a Juris Doctor hood. As associate dean of student affairs Sondra Tennessee explained: “We did not want any student to be left out of commencement for any reason, and particularly not for religious observance. 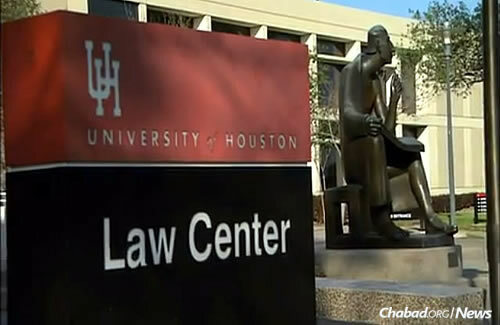 I consider the University of Houston Law Center to be a place of inclusion. Not only is Brian a respected member of the law center community, he is family. School administrators have made graduation accommodations for students in the past, but Tennessee noted that this was the first time they had done so for religious reasons. It was a decision that won the praise of Rabbi Lazaroff. “I think this speaks volumes about the school’s ability to be creative and supportive of a student’s personal needs and spiritual desires,” he said. Hutchison’s private commencement ceremony was held in a campus conference room this past Friday and was attended by his family, some of his law-school classmates and several school administrators. 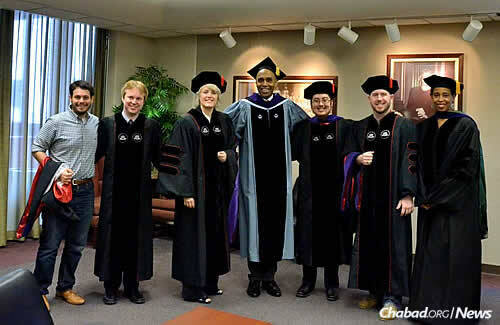 On Saturday, Hutchison was at synagogue while the rest of the law class celebrated their big day. Recounting words from a talk delivered on Shabbat morning by Rabbi Shimon Lazaroff, head emissary at Chabad Lubavitch Regional Headquarters in Houston, he says that when Jews make a sacrifice for G‑d—in this particular Torah portion, by observing the laws of shemittah, the seven-year cycle of letting the land rest in Israel after six years of toiling on it—they get an even bigger reward.